Volcanoes are openings in the earth's crust from which lava and gases escape. Volcanic eruptions are an important part of the genesis and of our planet's ecosystem. Volcanism dominates the lives of millions people and created wide parts of the appearance of the earth. Volcano videographer, Marc Szeglat, reports from the world of volcanoes and volcanic activity. Here you will find general information about volcanoes and volcanology. In the blog you can read latest news about eruptions, photo galleries and videos of volcanic eruptions. Since 2015, Marc has been a board member of the "Volcanological Society e.V.". This page is the english version of vulkane.net, which is much more extensive and appears in german language. Mount Etna is the most majestic volcano of Europe. With an altitude of 3454 m and a circumference of roughly 150 km it dominates the east coast of Sicily. Etna is one of Italy's most active volcanoes. The Mountain is a complex shield volcano that can erupt in very different ways. Etna is known for its effusive eruptions, which produce large lava flows. These can destroy villages, but are rarely dangerous for humans. 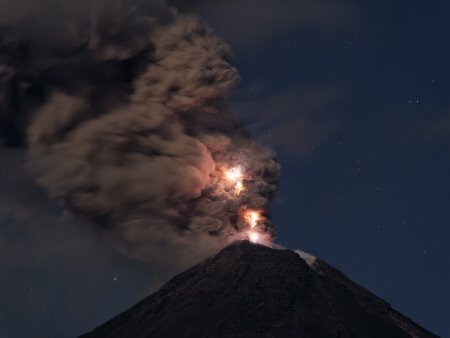 In recent years, the volcano produced a number of phases with explosiv and effusive paroxysmal eruptions. These eruptions usually begin with strombolian explosions, which intensify in the course of hours or days to high lava fountains. At the beginning of the short-term main phase, a lava flow begins to flow. This reaches relatively high speeds on steep terrain of the peak region. A new crater cone was formed by these paroxysm in recent years. In the spring of 2017, some people were injured when a phreatic explosion occurred. A lava flow came into contact with the melt water of the snow cover, which caused the water vapor explosion. Erta Alé is a flat shield volcano in the Ethiopian desert Danakil. In the summit area there are 2 calderas, which arose along the main fault directions of the Rift Valley. In the northern caldera a pit crater has formed in which a lava lake boils since decades. The activity increased in December 2016: there were several lava overflows of the lava lake. Lava flowed through the east part of the caldera. In January a second lava lake established in the southern caldera. Since then two lava flows have flowed over the volcanic flanks. They reach lengths of 7 and 4 km. Kilauea is located on Big Island Hawaii. This shield volcano is one of the most active volcanoes in the USA. As a hot-spot volcano in the middle of an oceanic plate it produces very low viscous basaltic lava. Time after time, spectacular lava lakes are formed in the craters Halema'uma'u and Pu'u 'O'o. The lava flows are often active for several years. They are known to reach the ocean. In 2016 lava flow 61g reached the sea. A lava delta was gernerated. In January 2017, the lava delta collapsed and a spectacular lava hose (or better lava fall) emerged. It was active for several weeks and very popular with tourists. Merapi is located in the direct vicinity of the Indonesian major city Yogyakarta. This volcano is a high-risk volcano and is well observed by the volcanologists. Merapi often erupts explosively, or forms domes and dangerous pyroclastic flows. It is one of the subduction zone volcanoes within the Pacific Ring of Fire. Typical of subduction zone volcanoes such as Mount Merapi, is the flow of highly viscous magma, which does not emerge in classic lava flows or lava fountains, but is dammed in the form of a dome at the summit of the volcano, until the edges of the lava domes are so steep they slip off, or until the dome breaks down in itself, thus creating the dreaded pyroclastic flows. Most recently this happened in 2010. During this eruption more than 350 people died through pyroclastic flows. These reached distances up to 20 km. Nyiragongo is one of the volcanoes, which are normally relatively harmless. A lava lake boils in its crater. But this lake occasionally leaks out through faults in the volcano's flanks. The lava then flows into the Congolese city of Goma and causes major destruction. This happens last time in 2002. Mount Nyiragongo is one of the most activ volcanoes in eastern Africa. The stratovolcano has got an elevation of 3470 m and is one of the seven Virunga Volcanoes. The main crater is about two kilometres wide. The lava lake has been the most voluminous known lava lake world wide. The depth of the lava lake varies considerably. A maximum elevation of the lava lake was recorded at about 3,250 m prior to the January 1977 eruption. Ol Doinyo Lengai is known among the Massai in Tanzania as the "Mountain of God". The volcano is a rarity for volcanologists because it produces the coldest lava in the world. The carbonate-based lava looks like mud and is approx. 500 degrees hot. In the year 2007, Ol Doinyo Lengai erupted vigorously. Black lava fountains rose high above the crater and ash covered the area. The cattle of the Massai found nothing more to eat and starved. A new cone growed in the crater. Nowadays its cold lava seethes deep in the pit. Piton de la Fournaise is located on the island of La Réunion in the Indian Ocean. It is one of the most active volcanoes in the world, and has many similarities with the Kilauea. Most eruptions are wonderful natural spectacles, but occasionally villages are destroyed. In recent years Piton de la Fournaise erupts roughly 3 times each year. Last really major eruption was in 2006. A 1 km long fissure opened on the outer flank and a huge amont of lava flows downhill, reached the sea after some hours. Soufrière Hills in the Caribbean is a dangerous stratovolcano with many domes forming its summit. 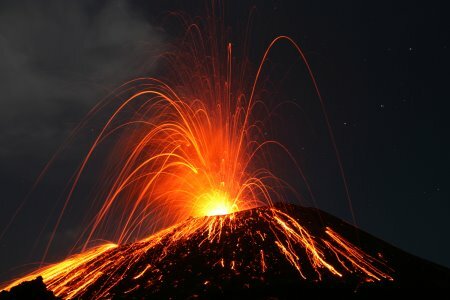 Last eruptiv period ended in 2010. Between 1995 and 1999 a disastrous eruption took place. A lava dome begun to grow and pyroclastic flows destroyed the capital of the island of Montserrat: Plymouth now looks like a ghost-town. At least 18 people have been victims of the eruption. More than 7000 people had to leave their home and were resettled. Vesuvius achieved tragic fame when its pyroclastic flows destroyed the Roman cities of Pompeii, Herculaneum and Stabiae in the year 79 AD. The explosive eruptions of Pompeii are powerfull: highly rising ash clouds generated gigantic pyroclastic flows that burned all lives two thousand years ago. Archaeologists excavated 2000 corpses. A total of 16,000 victims are expected. Several million people now live in the area around it. 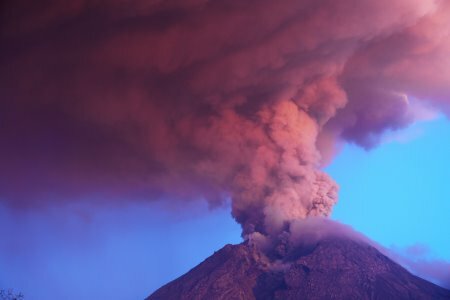 Another disastrous eruption is likely. The last eruption in 1944 was explosive and effusive. The ashe clouds were not as large as in the time of Pompeii, but lava flows destroyed some villages. Yellowstone is the oldest national park in the USA and one of the world's largest calderas. The volcano has the potential for a super volcano eruption that could change the global climate and lead to an extinction of species. Its cataclysms take place at intervals of approx. 640,000 years. A new eruption is statistically due. The Yellowstone caldera currently houses a unique natural landscape with numerous geysers and hot springs. The most famous are the Grand Prismatic Spring and the Old Faithful Geyser. A volcano is an opening in the earth's crust. Molten rock and gases that rise from the earth's mantle escape. The molten rock solidifies and accumulates in the form of lava around the opening. The result is an elevation, or a conical shaped mountain referred to as a volcano. What takes place during a volcanic eruption? During the ascent of magma to the surface, the principle of hydrostatic pressure relief takes place. Magma is less dense than the surrounding rock and it begins to rise like an air bubble in water. During ascent the external pressure on magma decreases and it is decompressed. Gases that till this point had been dissolved in the magma escape like the opening of a champagne bottle. Once at the surface, lava is expelled into the air by excess gas pressure and the volcano erupts. Where does the lava come from? Lava which is still underground and contains much gas is referred to as magma. This is primarily generated by the partial melting of silicate rocks in the earth's mantle. Magma can also form due to the melting of subducted earth crust which occurs along the plate boundaries. Mainly the chemism of the magma determines whether the volcano erupts effusively, or explosively. Depending on the composition of the lava and the depth and the speed at which the magma rises, the temperature of lava can vary between approximately 500 ° C and 1250 ° C. The coldest lava found on a volcano was 450 ° C hot. This temperature was meassured on Ol Doinyo Lengai in Tansania. The hottest lava I know was erupted from Piton de la Fournaise during the eruption in 2007. How fast can lava flow? This is dependent on the composition of the lava, its temperature and the concentration of crystals it contains. 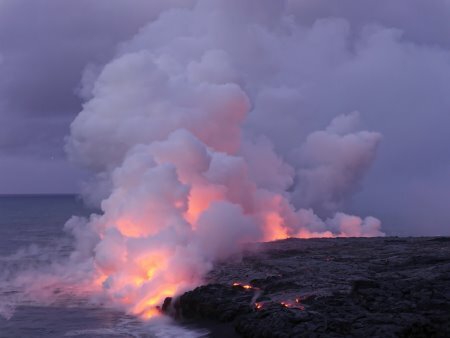 In general, the more silicon dioxide contained in lava, the colder lava is and the more crystals and bubbles lava contains, the slower the lava. It can become so tough that it no longer flows, and become lodged in the crater (doming) like a brittle cork. At the other extreme are low-viscosity, hot lava flows (pahoehoe lava on Hawaii) that can reach speeds of 100 km / h on steep slopes. Where are most volcanoes located? Most volcanoes form along the continental margins and along the plate boundaries around the Pacific Ocean. This region is therefore referred to as the "Ring of Fire". Many volcanoes extend along divergent plate boundaries such as the mid-ocean ridges. Volcanoes also occur along continental fault zones such as the East African Rift Valley. 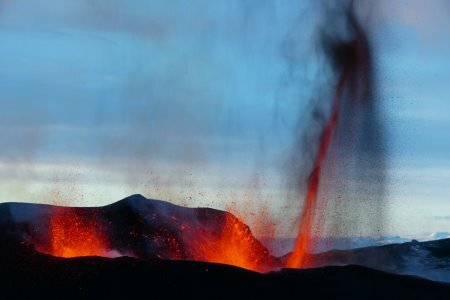 There are also "hot spot" volcanoes such as Hawaii and Yellowstone which are formed by mantle plumes that rise from the core-mantle boundary. 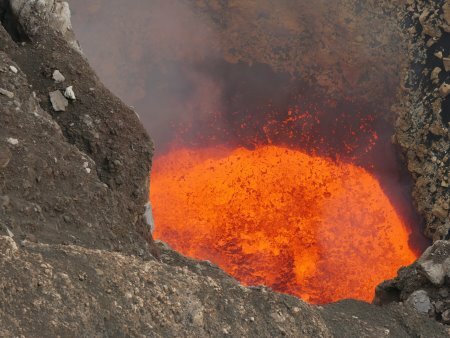 What is the most dangerous hazard on volcanoes? Pyroclastic flows are the main hazard during ash rich eruptions and pelean eruptions on dome volcanoes. If a lava dome, or a huge ash cloud collapse may result in an avalanche of volcanic ashes, blocks and gases. These avalanches can reach speeds up to 400 km / h and be hot over 800 degrees Celsius. Pyroclastic flows can travel long distances and flow over water. Rising ash clouds pose a serious hazard to air traffic. The ash can destroy the engines and the cockpit-windows. The volcanic ash can cover fields and can lead to bad harvests. Ash eruptions in connection with heavy rain can cause lahars. These are a type of mudflow and debris flow which are able to bury whole communities. Wet ash is so heavy that the roofs of the houses collapse. In case of an explosive eruption tephra is able to endanger people close to the volcano. An impact of a lava bomb is mostly deadly, if persons hit directly. Lava lakes and lava flows only rarely kill people. But fast moving lava flows can do it. They can also destroy homes and entire towns. Of course you should not plunge into a lava lake. How likely is the eruption of a supervolcano such as Yellowstone? In the media, the term "supervolcano" is often used and associated with an imminent eruption of the Yellowstone volcano. It is true that a volcanic eruption in the Yellowstone Caldera is statistically overdue and that magma is moving in the caldera underground which leads to the swelling of the caldera floor and the emergence of new hot springs. However, local volcanologists agree that a volcanic eruption is not imminent. The highest volcano on mainland is Nevado Ojos del Salado in Chile. This volcano is 6885 m high. Its last big eruption took place 1000 years ago. Today the volcano is in a stadium of fumarolic activity. The highest volcano on world is Mount Mauna Loa on Hawaii. The volcano rises 4139 m above the pacific ocean but from its base on the ground of the sea Mauna Loa measures more than 9000 m. Mauna Loa is the highest Mountain on earth. Another volcano on Hawaii is Kilauea. This is the most active volcano in the USA and for more than 30 years in almost permanent eruption.